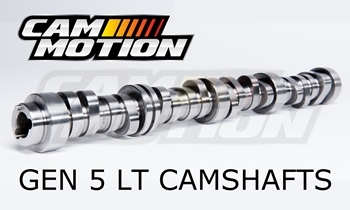 Cam Motion’s Gen 5 LT camshafts are optimized for superior performathese cams utilize our renowned smooth, quiet and powerful cam lobes that are known throughout the LS community for quiet valve-train operation and maximum upper RPM stability. Cam Motion Gen 5 LT Camshafts are 5150 steel alloy. All Cam Motion Gen 5 LT cams are equipped with our .295" tall fuel lobe (commonly referred to as the "33% increase lobe"). This higher lift fuel lobe will help your direct injection mechanical fuel pump deliver the increased fuel volume your vehicle needs for high performance use. IMPORTANT NOTE WHEN DELETING THE CAM PHASER ON YOUR GEN LT CAMSHAFT: Eliminated the VVT phaser is possible using our specially modified LS Style VVT Delete Camshaft Timing Gear and our special VVT Delete, Billet Front Timing Cover. Failure to use the correct Cam Motion accessories with the proper corresponding camshaft can result in serious or catastrophic engine damage. For more information, contact Cam Motion technical support.